Stereo Headphones & Headset, fitted with dual 3.5mm plugs for computer connection. 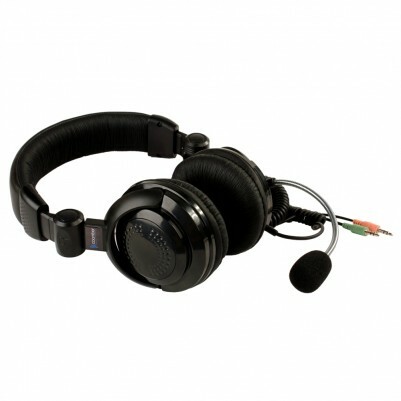 The 41390 headphone/headset has been designed rigorously tested and tuned to suit modern computer based products such as Desktop computers, iMacs, laptops, netbooks, etc. Accurate audio reproduction: Powerful but perfect crystal clear sound. Efficient crisp response across the audible frequency. Robustly designed but comfortable: The 41390 stereo headphones have a comfortable sturdy headphone design. The soft cushioned ear pads are angled to gently follow the contour of your ears so that they don't 'bleed' sound to distract adjacent people and minimise background distractions. They have left & right markings to ensure correct phasing of listening. An adjustable, cushioned headband distributes weight evenly across the top of your head. Together, with the ear pads, they help provide hours of continuous and comfortable listening. These headphones are a simple fold up design for easy storage. Versatility: The microphone is mounted off the earpiece by a flexible but stay-put mount. This allows adjustable and comfortable positioning of the microphone for the personal choice of the user. The quality and range of pick up is impressive. It allows the headset to be used with language software, voice recognition software, gaming and Skype, etc. Tangle-free coiled cables: The tension is free enough to allow easy movement but it will retract when unplugged ready for storage or transportation. The cable length is 1.6mtres long extended.